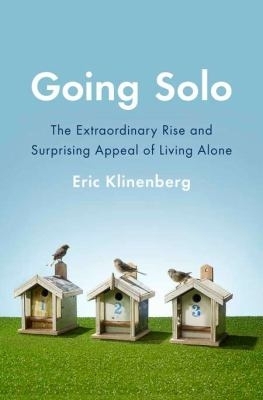 As all my facebook fans know I’ve been deeply absorbed in a new non-fiction read: Going Solo: The Extraordinary Rise and Surprising Appeal of Living Alone by Eric Klinenberg. Through both anecdotal and statistical evidence Klinenberg examines the new reality of 31 million US residents—roughly one out of every seven adults—live alone. By the way, I love a good non-fiction. Reading this book reminded me of the excitement I felt when I read The Great Good Place by Ray Oldenberg, Bowling Alone by Robert Putnam- which discusses social and political loneliness not living arrangements, Urban Tribes by Ethan Waters, and The Big Sort by Bill Bishop. Books like this make you feel validated because someone is taking your life choices seriously and examining them for both good and bad side effects. Recently this has been on my mind because in moving to the family ward I have found an untold number of people who are surprised even shocked that I live alone. This happened so frequently that I began to feel hesitant in bringing it up and perhaps a bit of defensiveness. Who, after all, does not feel a little bit defensive when their lifestyle is questioned. This reaction is particularly weighted in my community where marriage is not only a goal for a happy life but a requirement for exaltation and eternal life. By choosing to live alone during this portion of my life some may fear I have abandoned hope of meeting Mr. Sunshine, or that I have something against marriage. This couldn’t be further from the truth. I strongly support traditional marriage and believe it is a holy institution. From my view living alone is proof of that support. I value the institution enough to not settle for anything less than the right person. That said- I value my life enough to keep moving forward and progressing with or without a man. Perhaps this feels more natural to me because I’ve never really had a romantic partner. Not sure why but it is the truth. I have always been a social butterfly, with lots of friends and activities but never met someone I wanted to date more than a couple times or certainly marry. The way I see it finding the right person is not in my control. I can do what I can but even when doing those things he may not come into my life. God has His reasons for this and I trust Him. What can I control? I can control where and how I live my life. I can control how hard I work, what friends are worth nurturing and what activities are worth my time. For me, living alone is my opportunity to control my life in a definite and concrete way. I love that! For example, by attending church each week I am deciding what I believe and want to dedicate my life to. There is no one else to get me out the door or push me into getting ready. I am not doing it to set an example for children or to keep a relationship happy. I am doing it because I believe it is true and the best way to live MY LIFE. I would wager to say that even in the healthiest of relationships there are periods of isolation and loneliness that top anything I have felt through living alone . There are a few moments where I wish I could call on someone to help with the groceries or fold the laundry (laundry I detest). The times I wish I didn’t live alone the most is when I am sick because there is no one there to take care of me and nurse me. Luckily such moments are few and far between and I make do. In general I believe I am not a lonely person despite living and working alone. The great thing about living alone is all of those interactions are done by my choosing. I am not forced to be friends with my husbands peers or make nice with my kids friends parents. Is that not a blessing? Klinenberg goes on to say that not only can it be a blessing to live alone but it is in many ways the fulfillment of the American spirit. The idea of self reliance and rugged individualism is woven into the fabric of the American dream. Ralph Waldo Emerson said in his essay ‘Self Reliance’ that “society everywhere is in conspiracy against the manhood of every one of its members” and “Absolve you to yourself, and you shall have the suffrage of the world”. Henry David Thorough made the case for self reliance by moving out to Walden pond and living alone “I have, as it were, my own sun and moon and stars, and a little world all to myself” . That’s how I feel about my apartment. It is a little world all to myself. I have a form of freedom that is not possible in a relationship, and while I would love to meet someone, I don’t think there is anything wrong for appreciating the life I have, while I have it. As a silly example, I have pink bed sheets and pink curtains with 2 Audrey Hepburn posters on my wall as a headboard of sorts. Could I have this room when I marry? Probably not and I’m OK with that but its exciting to do things uniquely my way while I have the chance. I also have the freedom to live my life the way I want. For example, a friend of mine recently told me about the efforts his wife makes at keeping him on a diet. Portioning out food, making only healthy recipes and scolding him when he diverges off the plan. I laughed when he told me saying ‘and people think in Mormon marriages the man rules the roost!’. In some ways this is very touching and loving but it made me feel proud of my own weight loss journey. I did it on my own with no micromanaging from anyone. While everyone’s support has been key the day-to-day decisions are mine. 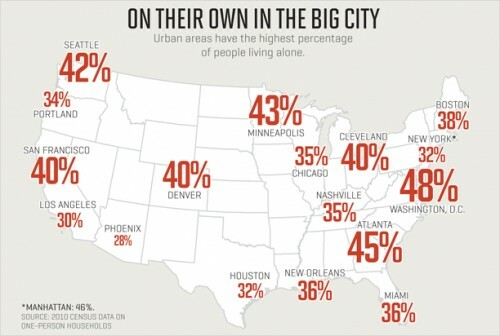 Almost half of the people in DC and New York live alone. Amazing. There are also more silly benefits of living alone including full usage of the fridge (and particularly freezer space), full control of the television and the DVR space, freedom to keep the home as clean or messy as you wish, and entertain as little or as much as you prefer without asking permission from roommates or spouses. I can also put up whatever Christmas tree or other holiday decor I want without consulting any other opinion. My apartment is something that is mine and mine alone. Is there not something appealing about creating your own space that is just for you? I am sure if I do get married I will still need my own space whether it be in the form of a garden, park, room or even a jetted tub! I also have complete discretion on how I spend my money, which to me is very empowering. I can take a long shower or turn my heat up to whatever I want. I can take a trip if I decide I have the money for it. I can go out to eat or get frozen yogurt before dinner. I can lead the life I want to lead. I love that! I enjoyed living with roommates for years, had 31 of them from 17 to 28. I had good relationships with all of my roommates and 3 of my current best friends were former roommates. I loved creating a mini-family with my friends but there just became a time where I needed to move on from an adolescent roommate experience to a fully functional grown up living on my own experience. The cravings to have my own space really started after my mission- the ultimate shared experience, 24/7 no breaks with a total stranger. I was a little scared at first that it might be socially difficult but I’m so active with church, gym, voice lessons, friends etc that I honestly have not felt lonely much. In fact, I revel in the sanctuary I’ve created for just ME! Aside from getting married, I don’t think I would like having a roommate again, even with someone I love like a family member or dear friend. I’ve always been fiercely independent, so in many ways living alone is the ultimate example of my nature. I have achieved independence in every way possible and yet I’m still a remarkably social and giving person. I have found a lifestyle that I like, even if it stumps and confuses others. Hopefully by knowing me people’s views will be expanded and stereotypes erased (speaking of stereotypes… I do not own a cat. I’m allergic!). I work alone. I live alone. I’ve traveled alone. I go to the movies alone (something that befuddles most people) but in truth I am never really alone. Jesus Christ and His spirit are always with me. I have spent probably a cumulative month of my life feeling truly alone and those were some of the hardest days, but learning to reach for my Savior during those tough times made me a believer to the end. He has never abandoned me in the lonely times. If anything I feel His presence more and more with each tear I might cry. “Jen: Love all the comments…so spot on – being able to take up all the space (everywhere, including all the closets), hog the T.V. with Lifetime movie marathons, enjoy wine and cheese for dinner! We do sometimes get that extra attention and worry that people assume is met by a spouse or roommate. .
After getting over the initial feeling of loneliness there was a lot to love: my whole house with the pink/red/white color scheme; my pretty, soft bed with the white coverlet and pile of pillows that were arranged just as I like (and was actually made every day); knowing that I could go home and make dinner with what was I KNEW was in there, instead of getting home and finding that someone had eaten all the cheese; knowing that everything was right where I left it and if something wasn’t put away there was only one person to blame. And as much as I love my husband, I miss these days sometimes. Also, about roommates. I had great experiences with roommates but there came a time where I ran out of people to be roommates with. When it comes to living alone or having a grab bag roommate I chose living alone.